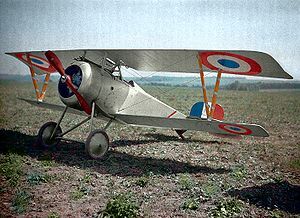 The Nieuport 17 was a French biplane fighter aircraft of World War I, manufactured by the Nieuport company. The type was a slightly larger development of the earlier Nieuport 11, and had a more powerful engine, larger wings, and a more refined structure in general. At first, it was equipped with a 110 hp (82 kW) Le Rhx�ne 9J engine, though later versions were upgraded to a 130 hp (97 kW) engine. It had outstanding maneuverability, and an excellent rate of climb. Unfortunately, the narrow lower wing, marking it as a "sesquiplane" design with literally "one-and-a-half wings", was weak due to its single spar construction, and had a disconcerting tendency to disintegrate in flight. Initially, the Nieuport 17 retained the above wing mounted Lewis gun of the "11", but in French service this was soon replaced by a synchronised Vickers gun. In the Royal Flying Corps, the wing mounted Lewis was usually retained, by now on the improved Foster mounting, a curved metal rail which allowed the pilot to bring the gun down in order to change drums or clear jams. A few individual aircraft were fitted with both guns - but in practice this reduced performance unacceptably, and a single machine gun remained standard. The type reached the French front in March 1916, and quickly began to replace the Nieuport 11 in French service. It was also ordered by the Royal Flying Corps and Royal Naval Air Service, as it was superior to any British fighter at that time. Worthy of note is the fact that during part of 1916, the Nieuport 17 equipped every fighter squadron of the A�ronautique Militaire. The Germans supplied captured examples to several of their aircraft manufacturers for them to copy. This resulted in the Siemens-Schuckert D.I which, apart from the engine installation, was a close copy and actually went into production, although in the event it was not used operationally on the Western Front. Many Allied air aces flew Nieuport fighters, including Canadian ace W.A. Bishop, who received a Victoria Cross while flying it, and most famously of all, Albert Ball, V.C. Picture - A Nieuport 17 in flight at a display in 2007. Insignia is of the Lafayette Escadrille. Note that this is a scaled-down replica, and not a full size aircraft. Nieuport 17 Single-seat fighter biplane. Nieuport 17bis Improved version of the Nieuport 17. Bruce, Jack. "Those Classic Nieuports". Air Enthusiast Quarterly. Number Two, 1976. Bromley, UK:Pilot Press. pp. 137-153.